Barcelona’s TV3 debuted a new hybrid virtual set from Orad that combines real fabricated scenic elements with virtual backgrounds and augmented reality graphics. 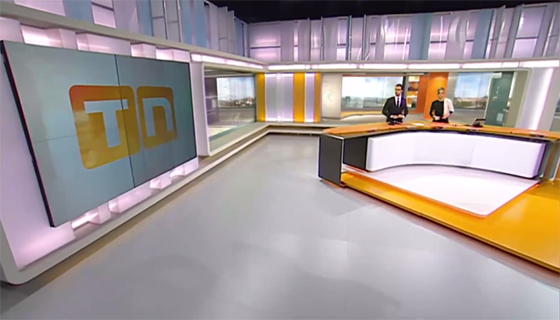 The new studio is the fourth Orad based virtual studio used by TV3. The studio is used for prime time productions including daily news, weather, breaking news and other news programs. The new set offers a powerful new dimension to TV3’s productions by enabling them to manipulate the broadcast for maximum effect. The studio is divided into two areas; the main area which contains a virtual background over which the virtual graphics are keyed. It is further enhanced with rich augmented reality graphics and a large video wall resulting in an immersive virtual environment that accommodates a variety of productions. The second half of the studio contains a huge cyclorama where TV3 produces their weather segments. The new TV3 studio is 300 sqm of which 200 sqm is covered by Orad’s Xync infrared camera tracking system. 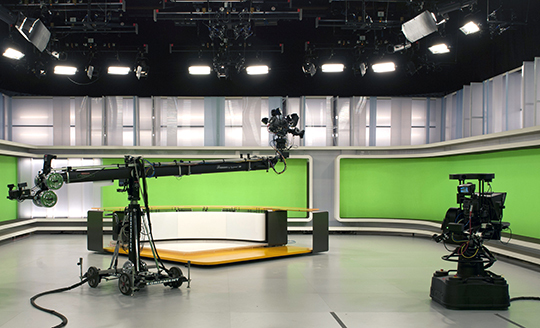 The Xync system allows TV3 maximum production flexibility based on its free camera movement support for the six studio cameras studio. Each of the six cameras is rendered by an Orad HDVG graphics engine providing both the director and the cameramen a preview of the composited image. The integration with Canon Lens and Vinten-Radamec for support Digital Protocol also adds better lens tracking for zoom, focus and depth of field parameters.